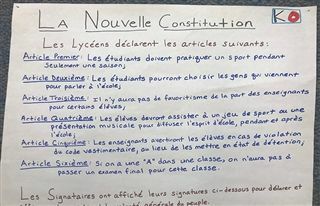 Challenging our students to become more autonomous in the classroom, Dr. Jonathan Briggs tasked the students his AP French Language and Culture to create their own constitution after reading the original French excerpts of Jean-Jacques Rousseau’s earth-quaking work of 1762, The Social Contract. A key tract of the Enlightenment era, this work exhorted the people to question the authority and legitimacy of the monarchy and the Roman Catholic Church, arguing for a society built upon the laws that the body politic created themselves. Initially, the students broke out into teams of two or three and drew up five to six new resolutions that they would like to see instituted at the school. One student served as the moderator for the class that assembled much like the charged atmosphere of the Paris Convention. Briggs said, “I took myself out of the mix. The students had incredible debates. I was amazed at how well they conducted themselves and how they argued with purpose.” The class, conducted entirely in French, empowered the students to work through problems and solve them with careful negotiation. “It’s a question of trust. I knew they would do a great job. It was all them,” Briggs said. Learning languages at KO is not confined to verb tenses and vocabulary drills. Part of the curriculum is designed to work with major themes and sub-themes like science and technology, the quest for self, family and community and beauty and aesthetics. This particular unit dovetailed with Upper School teacher Ted Levine's Political Science class, and the two teachers worked together underscoring the connections and relevance between Rosseau’s work and the world today. “What is going on in the world today is not an isolated vacuum. Democracy is dynamic. And what Rousseau was thinking in theory still works today.” Briggs believes students need to understand the responsibility of voting and being engaged politically since men and women fought and died for their right to participate in the process. Briggs left the final decision to the students to form their constitution and acknowledged that some of the exchanges were animated, just like on the floor of Congress. After much jockeying, the students agreed upon the following six articles: students must practice a sport for only one season; students determine which guest speakers are allowed to visit the school; there will be no favoritism shown to students; students must attend either sports events or theater productions to enhance school spirit; students will be warned initially about dress code violations; if a student receives an “A” in a class, the student doesn’t need to take a final. Briggs required each student to sign the document and place the work on public display to show the endorsement of their decisions. “I want the students to know that they have the power to shape and form the government. These students are our future,” said Briggs. Magnifique!